Of all the different casino games that are played with dice craps is by far the most popular. The object of craps is to guess the outcome of the roll of the dice. 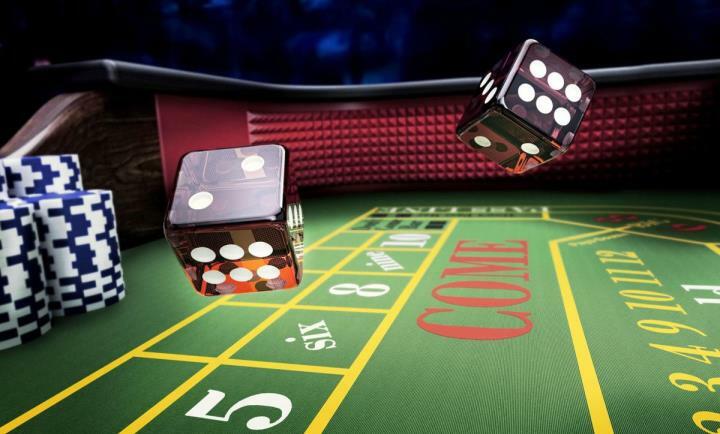 The rules of craps are a bit harder then most of the other casino games and maybe that is why it has the best odds for the player of any other casino game. Each player at the craps table will get a turn at rolling the dice. The Shooter is the name of the player currently rolling the dice and the first roll of a new shooter is called the come out roll. Pass Line – By betting the Pass Line bet you win if either a 7 or an 11 is rolled and if a 2,3 or 12 is rolled it is called Craps and you lose the bet. If any other numbers are rolled that number is the point. Don’t Pass – This bet wins if a 2 or 3 is rolled, ties if a 12 is rolled and looses if a 7 or 11 is rolled, any other number becomes the point New Shooter When rolling the dice for the first roll you are the New Shooter, and as such you have to bet the table minimum on wither the Pass Line or the Don’t Pass Line. These are just the very basic of the rules and bets for craps, but it should be enough to get you started, and you will pick up the rest as you go. You can also find the history of craps and the tips on craps sections of this website helpful. Craps history is still a matter of debate, but most people believe that Craps originated from an earlier game called ‘Hazard’. The origin of the name, craps, comes from the French pronunciation of the word “crabs”, which is the nickname of the game Hazard. The name Hazard came from the Arabic words ‘al zar’ or ‘azzah’ which means “the dice”, and many people believe that the roots of the dice are in Arabic countries. The game of Hazard was developed in the 18th century and was played by the European aristocracy before arriving to America through the French citizens in Louisiana. Later the game was played on Mississippi riverboats. It was probably Bernard de Mandeville, citizen of New Orleans who simplified the game of hazard and invented the first version of craps. The game spread across the states with the riverboats and only after John H. Winn changed some of the rules, the game improved and eliminated the usage of fixed dice while making it a game of bets against the roller of the dice. Before Winn changed the game, Craps had a simple layout, featuring only the Field, the 6 and 8 and the Come bets. Winn improved the game and drew a space for the Don’t Pass bets. During World War II, many soldiers began playing the modern version of craps in order to entertain themselves during the horrible times. With the years, craps became more and more popular and common on casinos across the world, but during the 90’s the game lost some of its popularity for gambling machines such as video poker and slots. Only recently craps gained back its respect and became the biggest gambling game in terms of money wagered. Gambling industry experts believe that the possibility of playing online craps contributed to this popularity.